Dear Gardening Friends, In our zeal to offer you as many varieties of each vegetable & herb as possible, we've simply run out of room at our Farmers Markets to properly display Books! We still dearly love these selections and encourage you to include them in your own library for your enjoyment and edification, but starting in 2013, we will no longer be stocking or selling them through this website. What inventory remains will be sold at our various Sales at the Home Nursery until gone. And whenever another volume impresses us as these have, we'll add it here just as a suggestion. Many thanks to all who purchased books from us over the last 3 years! The complete textbook used in the California Master Gardener Program. Nearly 700 pages covering such topics as: Soil, Compost and Water Management, Home Vegetable Gardening, Berries, Citrus, Avocados, Plant Propagation, Safe Pest Contol, and Landscape Design. Lots of great charts and drawings. I love this book and go to it nearly every day! In this updated classic, the author unveils ten new improvements to his revolutionary gardening method which has been enthusiastically practiced for more than twenty-five years. With over half a million copies in print, this classic companion planting guide has taught a generation of gardeners how to use plants’ natural partnerships to produce bigger and better harvests. Covers Herbs, Vegetables, Nuts, Grasses and Grains, as well as Soil Improvement and a variety of Garden Plans. Louise Riotte introduces us to hundreds of flowers and all their friends (and enemies, too!). Includes companion planting properties, medicinal uses, histories, folklore and a variety of charming garden plans. With its beginning in the “back to the land” movement, this incredible work was written and re-written over a span of 32 years, with now more than 650,000 copies sold. A complete manual for living off the land and doing it yourself! An Encyclopedia of Country Living Guide offering everything you need to know about the fundamentals of preserving: freezing, drying, canning, root cellaring, curing, pickling, etc. Also covers cheese and butter making, and infused oils and vinegars. Filled with lovely photographs of over 70 breeds, this guide covers egg-laying information, hen house set up and options, advice on hygiene, disease and healthcare issues, egg incubation and rearing the next generation of chicks. A must-have book for an increasingly popular subject. Put your backyard to work with this indispensable guide to food self-sufficiency. Packed with information on gardening, preserving, orcharding, bee-, chicken-, goat- & cow-keeping, home brewing, preserving and seed saving. A no-nonsense guide to home fruit growing, completely revised and updated. The author, with 45 years of experience, offers detailed information on fruit cultivars, selection, fertilizing and pest control, soil requirements, pruning, thinning, harvesting and storing. Author, lecturer, and consultant, Lee Reich offers advice on selecting plants which bear delicious fruit and offer 3-season visual interest, and selecting the perfect site for them. This beautiful work also includes complete plans for 5 luscious landscapes and a detailed fruiting plant encyclopedia. Another gorgeous book from the Master of Edible Landscaping. With the focus on culinary herb gardening, this work is filled with design ideas, growing information and recipes which will truly inspire! Now You Can Have Your Gorgeous Garden and Eat It Too! This highly anticipated, just-released, updated version of Rosalind Creasy’s1982 groundbreaking classic is what Michael Pollan calls “exactly the book we need now, a volume that is itself as beautiful as it is useful.” Filled with horticulture and design information, resources, and gorgeous full-color photos. One of our favorite and most-used books, this is the definitive work about culinary container gardening! Clear information and simple directions about container growing Vegetables, Herbs, Fruits and Edible Flowers in every possible combination. 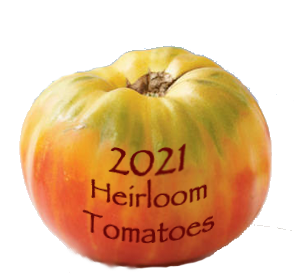 A delicious and visually stunning tribute to Heirloom Tomatoes! Filled with tomato history and lore, recipes, and highly detailed grading information on more than 200 beloved Heirlooms, with “portraits” photographed by Victor Schrager. A tremendous source of information when planning our Growing Organic Garlic Class! Learn everything about the subject from an expert who is truly enamored with this ancient food crop! Secrets of Salsa – 25 time-honored salsa recipes handed down through the families of these northern California coastal valley women. Initially an English-Language learning exercise, this project has a life of it's own and continues to raise money for the Anderson Valley Adult School. There's also a documentary, available on DVD, which was aired as a PBS Special. More than 25, 000 copies have been sold, and we are the only Southern California distributor of this lovely book. Click here to read the Women’s story. On Jo Anne’s “Top 5 Books of my Life” List, this is an enthralling narrative of Kingsolver and her family’s abandonment of the industrial-food pipeline to live a rural life – vowing that, for one year, they’d only buy food raised in their own neighborhood, grow it themselves, or learn to live without it. Funny, educational, and inspiring like no other! David Mas Masumoto is a third-generation Japanese American organic peach and grape farmer, freelance writer and farm activist. This lovely, poetic book follows his yearlong attempt to keep his beloved Heirloom Sun Crest peaches alive by farming in a “new way, working with and not against, nature.” As he puts it, “this year will decide my fate”… inspiring and educational. An eloquent and moving memoir chronicling the stroke of Mas’ father, and the heartache and victories they experience as Mas becomes the master to the teacher who once schooled him as a farmer. In this book, we see how our own destiny is involved in the future of our food and our land. Incredibly charming and inspiring! The simple act of connecting children to nature through gardening is Sharon Lovejoy’s special purpose and joy. In this book, she presents 12 spirited, easy-to-implement ideas for theme gardens that parents and kids can grow together. From Pizza Patches, Bean Tunnels, Sunflower Houses and more, these are projects to cultivate wonder! A Sierra Club Children’s Book, this charming work is a perfect introduction to vegetable growing for the littlest gardeners! Colorful illustrations enchant and inform. Resources and simple recipes are included.